The Oldest Manufacturer of Motorized Duck and Goose Decoys in the World Any good hunter will tell you that two of the most important elements on a still day are proper calling technique and realistic looking decoys. Imagine what those real ducks are going to think when they look down on your decoys and see THE REAL DeCOY® duck and/or goose decoys moving around in the water. The REAL DeCOY® motorized decoys flawlessly duplicate live movement and will bring your spread to life. 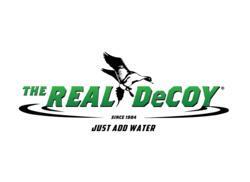 THE REAL DeCOY® motorized decoys are the quietest, most realistic decoys ever developed for the hunting market and hunters everywhere are amazed at how well even the most cautious of ducks and geese are attracted to the life-like action. Made by duck hunters for duck hunters. If you are a waterfowl hunter and need a motion duck decoy, you've come to the right place.